I like the real one... and the vegetarian version is also quite good. But seriously.. the mystery has been dragged on for too long... lets get a move on already! Anyway, here's my new post on the many suspects and possible villains in Memories of the Alhambra. ...As for Director Park, it would have been easier for him to get rid of Jinwoo at that moment he and Prof Cha discussed Hyunsuk’s autopsy. Right then, he could have disclosed the Programmer’s statement about Jinwoo bragging about “destroying” HS. But he himself didn’t want to believe that Jinwoo was capable of killing HS. Prof Cha: WE already decided. And I don’t want my son’s body to become a mess either. I don’t doubt Jinwoo. Therefore, there’s no reason to carry out an autopsy. What about you? What do you think? Park: (recalling his conversation with the Programmer and Jinwoo) I think it’s absurd… to doubt him. Of all people, he knew that Jinwoo expressed a desire to kill HyunSuk. Yet he didn’t voice his doubts aloud. See? Park knew two occasions when Jinwoo expressed enough hatred for HyunSuk to want to kill him. If Park really wanted to get Jinwoo, he could have usurped Jinwoo's leadership position back then by raising suspicions and demanding an autopsy. 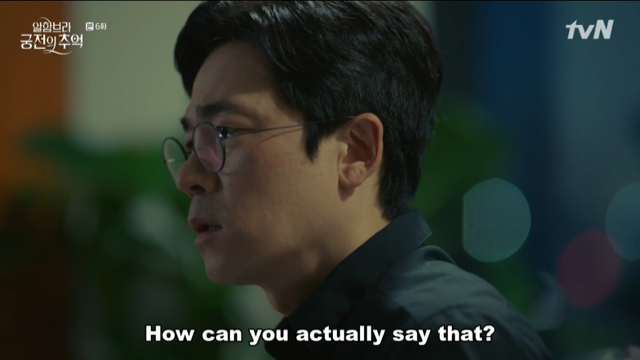 To me, his reply to Prof Cha "I think it's absurd to doubt him" was his way to calm his OWN self-doubts about Jinwoo. He’d been shaken by the death of Hyunsuk and by the thought that Jinwoo could have been involved in it. But he was giving Jinwoo the benefit of the doubt. He was clinging to his belief in his innocence. He wasn't going to be a "traitor". But seriously.. the mystery has been dragged on for too﻿ long... lets get a move on already! @lynne22 Ah.. I see her post on the thread a while ago. But haven't read it completely yet. Actually I didn't suspect on him. I don't believe and I couldn't think he's a twisted villain all this time. The one that I suspect is Prof. Cha. But it seems he's not the main villain behind all this game tragedy. So I would just think that it is the game itself is the problem, and it is still unanswered why would this game was created by SJ. I mean he could make other more human game without killing. @packmule3 analysis and writing style are so fun, insighful and witty. And @lynne22 I don't really bother by the story plot and all now, all I care is how they will end it later and more dimples + romances. See you again team sub. @lynne22 Yeah but I still doubt Mr. Park. See if he threw JW under the bus, and they proceeded with the autopsy, maybe there would've been some evidence there that might point directly at him. And you know how the writers try to throw things at us, so that we will believe he is a good guy, but turns out he is the darkest of all. For all we know, even PSH might be the one behind all this. LOL. I'm not trusting anyone in this show, except our narrator JW. But I also wish as @stargazer187said, that it might really be only game's fault. Let's see. Are you guys ready for tonight?!?!? Yayyyyyyy!!!!! !